Once located on Lowell‘s Gorham Street, St. Peter’s Church was founded in Lowell in 1841, ten years after the founding of St. Patrick’s, the city’s first Catholic church. Many readers will remember the impressive edifice that once stood at 323 Gorham, across from Lowell’s courthouse building; however, this was actually the church’s third building. St. Peter’s Church spent its first fifty years in two other locations. The first church building, made of brick, was built at the corner of Gorham and Appleton Streets and served the congregation from its founding until 1890. 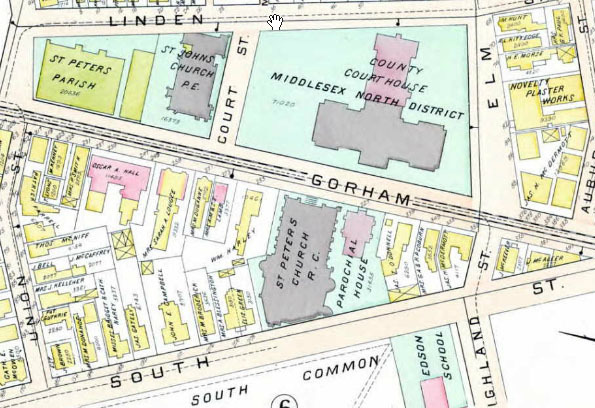 The Post Office building, located at the intersection of Lowell’s Gorham and Appleton Streets, marks the site of the original St. Peter’s Church, which had been demolished several years before this 1896 map was drawn. St. Peter’s Orphanage still stood on Appleton street, just two doors down from the original church location, at this time. As Lowell’s Catholic population surged through the 1880’s, it soon became very obvious that St. Peter’s would need a newer, larger church building. Rev. Michael Ronan, pastor since 1883, negotiated the sale of the land on which the first St. Peter’s stood, to the federal government for the construction of a new post office. The funds from that sale allowed the church to build a larger building, but the timing of the new post office’s construction schedule did not allow St. Peter’s adequate time to construct their new building. The first St. Peter’s came down, before the next could go up – and the congregation faced the threat of homelessness. Rev. Michael Ronan pastored the church during the construction. As the new Gorham Street building was constructed, a temporary wooden church was built very near the site, and served the congregation. That building’s size was still considerable: 120 feet long by 90 feet wide, and it stood 18 feet in height. The church moved its pews from the old church and seating was provided for up to 1,500 people. Its first mass was held on April 27, 1890, not even one month before the old church came down, on May 20, to make room for the new post office. 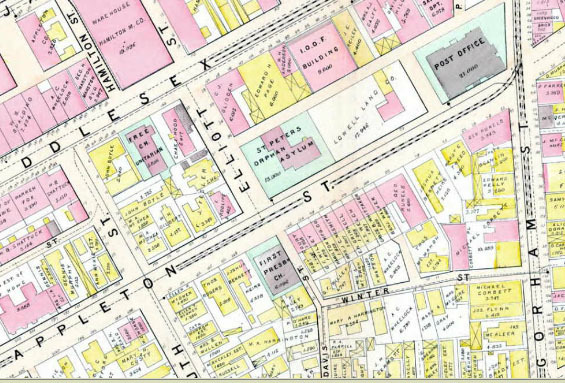 The map above, from an 1896 Atlas, shows the new St. Peter’s Church, in gray, across the street from the Courthouse, and the temporary church, in yellow, located slightly up the street, where St. Peter’s School would stand. Time passed and the congregation continued to use the temporary building for a couple of years. The congregation acquired land further down Gorham Street, and worked to clear some frame houses that stood on the site. 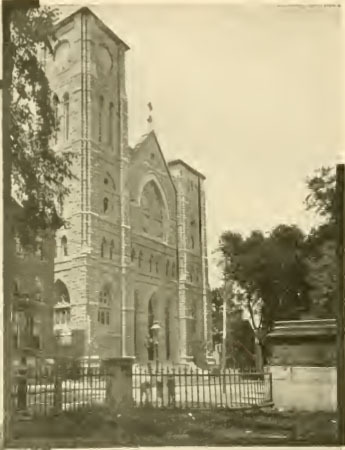 St. Peter’s Church, which stood on Gorham Street in Lowell, as it appeared in 1905. The building stood until its demolition in 1996. Construction began in 1892. Local newspapermen estimated that some 10,000 people packed Gorham and South streets to witness the laying of the cornerstone for the new St. Peter’s Church on Sunday, September 11 of that year under delightful weather. Even the floor that had been placed over the new foundation was packed with people. Along South Street, an altar and pulpit had been temporarily constructed; Irish and US flags had been set up for the Mass. Some 65 clergy helped in celebrating the Mass to commemorate the laying of the cornerstone, headed by Archbishop John J. Williams. Others hailed from churches all over Massachusetts, some near Boston, some closer to home in Lawrence, Massachusetts. The granite church was completed in 1900, instantly became a local landmark, and dominated the local streetscape for nearly a century. Its twin towers could be seen for quite some distance – one stood nearly 200 feet high, the other 176 feet high. Due to declining enrollment, the church closed in 1986. The building stood vacant for nearly ten years, falling into increasing states of disrepair while options for its next use were discussed. Eventually, no new use was found and the building was demolished about ten years later in the mid-90’s. Green space covers the site now, which is dominated solely by the courthouse. Rev. Michael Ronan’s memory lives on in Father Ronan Terrace, a cross street connecting Gorham and South streets, near the church’s former site. The church’s memory lives on in the building that once housed its rectory. Still standing next to the former church site, its red brick exterior is barely visible in the photograph above, at right (to the left of the church). An insurance agency now occupies the building. St. Peter’s Convent, crumbling and beyond repair, was razed several years ago to add a much-needed parking area for a local funeral home. I didn’t see it built but I watched them rip it down every day. One of Lowell’s saddest days. Most definitely. It’s a pity that the building couldn’t be saved. In a future post, I’m thinking about covering some of St. Peter’s midcentury history. The church is an important part of my own family. My father and both of his siblings graduated from its grade school, as did several of my cousins. I am trying to find out where the school records are for students. Does anyone know? Hi Aaron – I don’t have any photos of St. Peter’s other than the ones I’ve attached to this post. I’ll watch for them though, as I work through future posts. Whats your email I found a Rare photo of St.Peters Church in Lowell in color. My parents were married in St. Peter’s Church…I was baptized, First Communion, Confirmation, Graduated from St. Peter’s School, Married, my two children were Baptized here too. As well as other family members. Attending St. Peter’s School…i was in the Chorus…wonderful memory’s of Christmas Eve Mass singing beautiful songs to the parishioners…the Church looked magical with the lights…flowers and Manger. It still breaks my heart that the Archdiaocese did not all the parishioners or the Historical Society keep it. Why the city of Lowell allowed the loss of St Peter’s is beyond me. My parent’s were married there. I remember attending there and my mom and all of her siblings graduated from the grammar school where they apparently read and memorized Shakespeare and had it explained to the students by nuns as young children. What a tragedy! It was a sad day, indeed. My parents were married there and my mother, aunts, sisters and I all graduated from St. Peter’s School. We all made our First Communion and Confirmation there as well as singing in the choir. I have many memories of Midnight Mass and the Easter Vigils that were so beautiful. It was heartbreaking to see it destroyed. Hi Ellen – Thanks for your comment. I found the municipal marriage record at familysearch.org. It’s taken from the same books that the City Clerk’s Office would use to put together a marriage certificate. It’s got all of the information you supplied, and adds that John was 25 and a laborer at the time while Matilda was 23. Both were born in Ireland, John’s parents were John and Mary McCosker. Matilda’s are listed as Henry and Margaret O’Neil. The Archdiocese of Boston holds records too, which should cover that period, but wouldn’t contain much more than the municipal record – I think it would provide the names of witnesses too. I hope this helps you in your search. I don’t remember my very first days at St.Peters, but I do recall having my first Holy Communion and Confirmation there. I also remember Father Cahill, and mostly my very favorite the late Father Tom Jezak, Father Tom took my best buddy Bill Hanson and I on a cross country trip when I was 14-15 yeas old, also the late Dan Thurston was with us on that long 10,500 mile trip. It broke my heart to see such a beautiful and Peace giving Church tore down, it still makes me sick to think of it as gone. So many happy moment’s with my Mom and sisters and brothers were given there. I don’t understand what is wrong with the City, the state and our country to allow such a thing to happen, “I wonder what God thought about that” ?? Lance Noyes Sr. Limerick, Me. I went to St. Peter’s School (SPS) and made my first communion, confession, and confirmation at the most beautiful church up the street. We walked hand in hand double file up to the church every first Friday and Holidays. I remember giving readings from the book of Paul up at the altar. My favorite teachers in the 1970’s were Sr. Margaret, Sr. Anna Josepha, Sr. Anne, and Sr. Delia. Not to be a pain in the you know what but I must also add the Nun we all were afraid of….Sr. Joseph Girard! Good memories! I just found this blog about St. Patrick’s Church and I am looking for a family by the name “Ahearn” – particularly Jennie Ahearn confirmed on June 29, 1916 and Alfred Ahearn in Nov. 1916. In 1918 on Nov. 11, 1918 there is another confirmation on Jennie Ahearn and it says she took the name “Rita”. Can anyone tell me if they recognize these names or is there a record of them? Would like to return the Bible found in Louisiana to the family it belongs to. It was found in an antique store – Also mentions the name “A. McDonald. Any help would be appreciated. I wonder where St Peter’s historical records would have gone. My 2nd Great Grandmother, a Bridget Healey, was a member of the Married Ladies Sodality associated with the church and I wonder if there might be photographs somewhere of the group. My gradmother Maude Irene Manchester/Mongrain was buried from ST Peters on 11/3/1902 she was only 22 yrs old and died in child birth of her son.